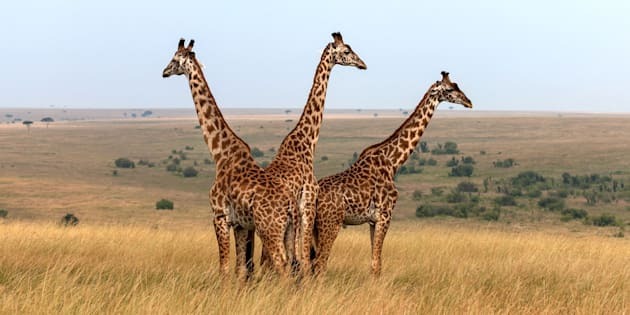 Three Masai giraffes in Kenya. The three giraffes laid lifeless on the ground, their long necks twisted at unnatural angles. Their bellies had been eaten clean by vultures; their ribs left exposed to the baking sun. Poachers in the Democratic Republic of Congo’s Garamba National Park had fatally shot the animals and left their carcasses almost whole. Like mighty rhinos killed for their horns or sharks for their fins, the giraffes had been slaughtered for just one body part: their tails. Giraffe tails are considered a status symbol in some African communities. Worth thousands of dollars, they’re used as dowries or made into good-luck charms. One of the giraffe carcasses found in Garamba National Park in July. This lucrative trade in tails, as well as the poaching of giraffes for bushmeat, has driven some populations of the animal to the brink of extinction. Following the triple killing earlier this year in Congo, for example, fewer than 40 individuals remain in the entire country. In western Ethiopia, giraffes are thought to number fewer than 120. “[These] populations are on the brink and constant pressure for bushmeat and other body parts may result in their local extinction if something is not done,” Julian Fennessy, a giraffe specialist with the International Union for Conservation of Nature and co-founder of Giraffe Conservation Foundation, said this week via email. And it’s not just these local populations that are at risk. Conservationists made a shocking announcement earlier this year: Giraffes are facing a “silent extinction.” For the first time, the IUCN had listed the animal as “vulnerable” to extinction; giraffe populations worldwide had fallen by up to 40 percent in just three decades, the organization said. But it seems that even this alarming assessment didn’t provide a complete picture. The IUCN has yet to account for new research suggesting that giraffes are actually four separate species, not just one. If the organization does embrace this new taxonomy, Fennessy said, three out of four giraffe species would likely be considered endangered or critically endangered — the two ratings before extinction. Researchers used DNA analysis earlier this year to determine the four genetically distinct species of giraffe: the southern giraffe, the Masai giraffe, the reticulated giraffe and the northern giraffe. There are two subspecies of southern giraffe and three subspecies of northern giraffe, the researchers concluded. “All but the southern giraffe” are currently decreasing in numbers, according to Fennessy ― some of them extremely so. The Nubian giraffe, for example, a subspecies of northern giraffe, has declined by 97 percent in three decades; just 650 individuals now live in the wild. The Masai giraffe has declined by 50 percent, to around 35,000, in the same period; populations of reticulated giraffe have plummeted by more than 80 percent. Fewer than 9,000 individuals remain. Fennessy noted it could take a long time before the IUCN adopts the new taxonomy. In the meantime, however, the organization is reviewing assessments of each of the nine giraffe subspecies that it has identified. These assessments, slated for release in 2017, could provide a more accurate picture of the threats facing different populations. In addition to poaching in some areas, the major threats facing giraffes in the wild are habitat destruction, fragmentation and degradation. Conservationists say education and awareness are key to saving giraffe populations.